Hi everyone! Sorry for the late post... it has been a stressful day at home! Today I have a duo that I searched for, to no avail, last year, but managed to find at TJ Maxx on sale, along with another duo I swatched a nail polish from earlier in the week, OPI Love is a Racket. So here is the Serena Williams Glam Slam Duo: Grape Set... Match and Servin' Up Sparkle! OPI Grape Set... 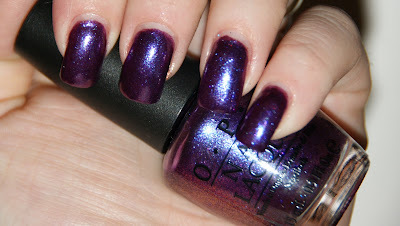 Match is a gorgeous royal purple nail polish with blue shimmer that gives it the appearance of a blurple! When pictures of these duos were first released, I knew this was the one I wanted more than anything. And I'm SO happy I got it! The application was a dream and with two coats, I could not have asked for better opacity. The glitter was a little too sparse for my personal taste (above was one coat), but I loved the inclusion of hexagonal glitter. 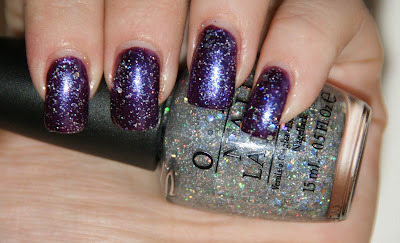 Hex glitter seems to be very on-trend this year, so OPI was ahead of the curve in 2011. Overall, I'm glad that I finally managed to get the duo and would definitely recommend Grape Set... Match. Grape, Set...Match! is sp pretty!